Hobbyking selling coffee roasting equipment now??? Hopefully they'll also market attachments to turn this into a rework tool for circuit boards! I'm holding out until they do a Behmor 1600. It's amazing to see such cheap stuff there... too bad the shipping is 170% the price! But in all seriousness, this mightn't be a bad gun for roasting coffee. If you have a local Harbor Freight, this'll be more cost effective! We have this thing called 'Bunnings' which is a huge, cheap hardware store. My heat gun came from there a few years back. This morning roasted ~ 100g of Indonesian Blue Batak with it. I'm sticking with my hot air popcorn maker (http://coffeegeek.com/guides/popperroasting), unless we somehow end up with a couple more coffee drinkers in the house. Meanwhile, trying to figure out why my shots have been borderline today. Haven't changed the grind, and got firmer with the tamping with each event, but pulling too quickly (~18s) and down to about 8 psi. Flavour and crema OK (a little lighter than usual) but earlier in the week I'd been getting consistent 11-12 psi shots, almost over-extracting at 29-30s... I think I might need to pack a touch more in to the basket. My milk however, has been perfect and latte art really coming along! Whoops, this is the RC forum, right...? I've been pulling brilliant shots lately. Perfect 'rat's tails' of crema hanging beautifully from the portafilter. And the taste shines through! 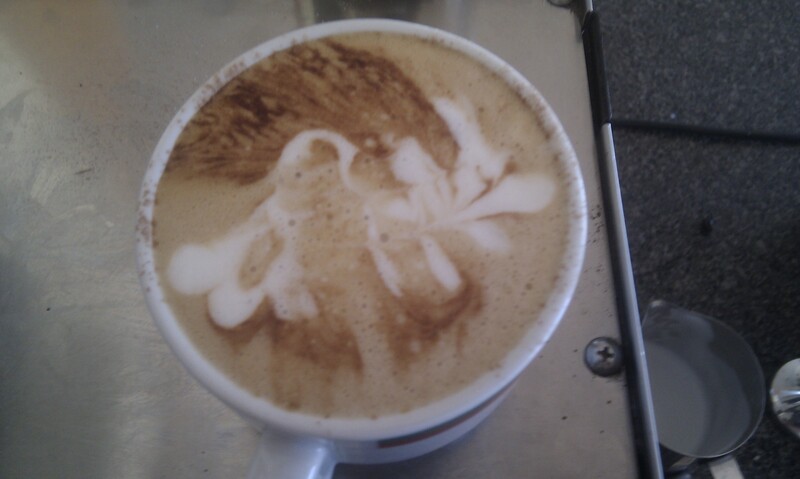 Can't say I'm huge on latte art, though the texture has been quite good if I don't say so myself. It seems your machine isn't enjoying the firm tamp. Maybe a bit more coffee and a 'lady's tamp'?? Check the puck - it should come out as one and break evenly in your hands. UPDATE: Shoved in some more coffee. I gave it a 'lady's tamp', but I probably overfilled it a touch, so in securing the group head I probably just did some more tamping. 29 second 60ml shot, nice, walnut skin coloured crema and a couple of layers of flavour. Pucks have been as you describe for all coffees, and it seems to be extracting evenly. Just I've missed that extra bit of flavour today. True, true. I tried taking a picture of my first successful one in Adelaide a couple of weeks ago (which is no mean feat because all the cups were different sizes), but I need pretty good light to get an image worth sharing. Mrs Lobstermash can attest to my progress though. And I'm not even using art friendly cups! Also excuse the bubbles in the milk - Mrs Glydr bought some Woolworths milk which is rubbish! (Gladly their shares have been performing better than their milk). But in all seriousness, this mightn't be a bad gun for roasting coffee using espresso coffee grinders. which machine is best for roasting coffee beans perfectly?